When my husband told me he made ‘Pro Club’ with work and the prize was a cruise I nearly fainted (out of fear!). I had a major fear of opened bodied water, cruise ships, I get seasick, have claustrophobia issues (I need rooms with opening windows) and a fear of drowning… Hello!! You can see how well this was working out for me! And how going on a cruise might trigger anxiety for me?!? Although most rooms aren’t that large (some are!) they are very comfortable, in saying that we didn’t spend any time in the rooms other than sleeping or getting ready, our schedule was jam-packed! The beds are comfortable and the shower has fantastic water pressure (better than ours at home!). There is room to hang your clothes and a little desk area for other things there’s plenty of room. The mini bar is great and filled with everything you need, so if the bar is closed and you want to keep drinking, take a bottle or two back on deck and keep on enjoying your night (like we all did!). The food on the ship was great (and I am fussy!). I did however struggle with my gluten free, vegetarian options therefore, I had to request a lot of meals which they accommodated for. I do eat fish and I must say the Sea Bass was great and the Crème Brulee was out of this world! We had a BBQ night, a cocktail reception followed by a sit down dinner, and then another sit down dinner. Everyone was happy with the food. (Blog posts coming soon on Fashion for these events under my Loving That Whats Next blog). There are a few bars located on the luxury yacht allowing you to spend time at the front or the rear of the vessel. Personally, I love the back of the yacht, there are two hot tubs with a pool and a bar (I’m upset about my Ralph Lauren bikini changing colour from being in the hot tube, it’s now unwearable which has annoyed me immensely! Also, others had their clothes ruined too). On the level above that, there’s another bar where the views are incredible. There is a gym on board if you are wanting to still work out whilst on vacation or you can treat yourself to a massage or two and a facial if you want a little bit of extra pampering. 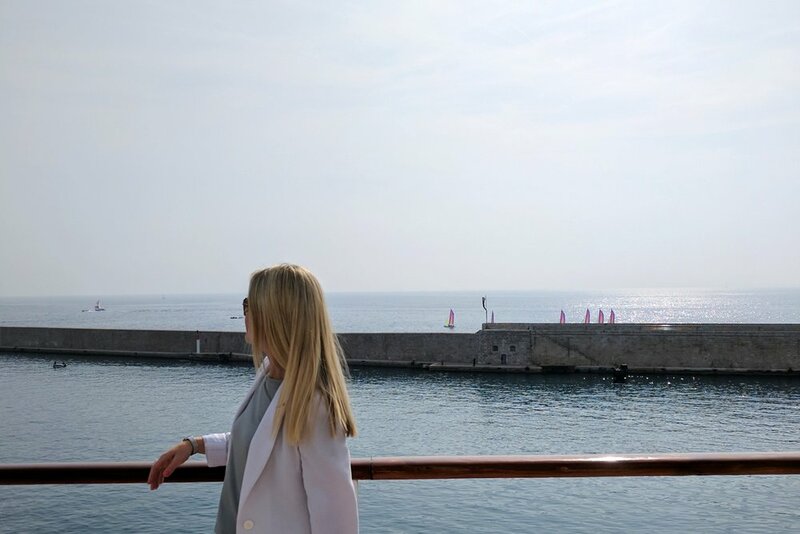 We stopped off in a few different places along the way and went sightseeing at Antibes in France and Portofino in Italy (blogs following soon) as well as a Black Tie Gala Dinner in Cannes blog post here! The staff on the yacht where wonderful! 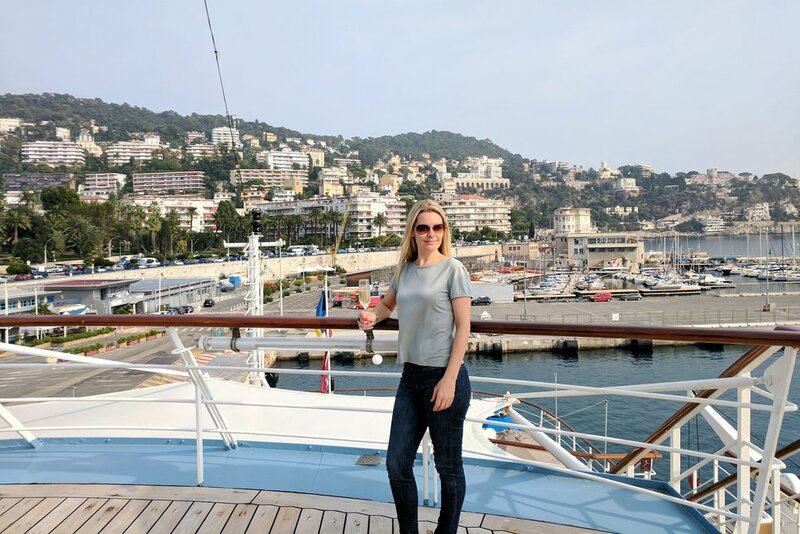 We had an absolute ball and for me, I got over my fear of open bodied water, cruise ships etc as we sailed along the French Riviera Coast Line. In saying that I wouldn’t go a huge cruise ship, but this is no ordinary cruise. This is a luxurious experience for those who like to travel in style!